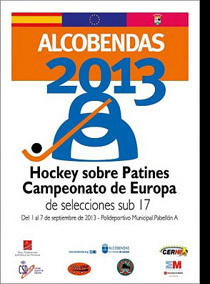 This years European Under 17 Roller Hockey Championships will be held at the Sports arena José Caballero de Alcobendas, Spain from 1st September to 7th September. A greater number of teams have entered this years competition forcing the organisers to increase the championships from six to seven days. Countries entered this year are Andorra, Austria, England, France, Germany, Israel, Italy, Portugal, Spain and Switzerland. Alcobendas, Spain from 1st September to 7th September. A greater number of teams have entered this years competition forcing the organisers to increase the championships from the usual six days to seven days. Countries that have entered in this years championships are Andorra, Austria, England, France, Germany, Israel, Italy, Portugal, Spain and Switzerland. Roller Hockey Photos will be covering the last six days matches posting all the action photos and scores.